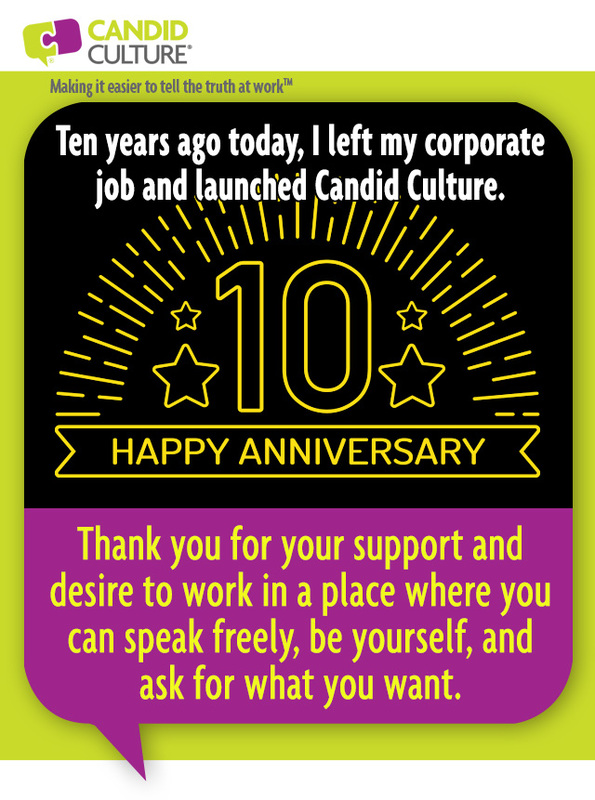 Ten years ago today I left my corporate job and launched Candid Culture, business communication training. I’ll admit to being terrified and being pretty convinced I would fail. I thought about starting the business for 12 years, but was paralyzed by fear. The only thing that finally motivated me to act, was that at the time, I worked for someone who didn’t believe me when I said I didn’t want the internal opportunity he was giving me. Don’t give a woman who can barely use Excel, leadership over the Finance department. The training and keynote speaking I do have evolved over the past ten years, as organizations’ needs have changed. A few things have remained constant. People struggle more than I ever realized when receiving negative feedback. People care about the work they do, want to do a good job, and want to be thought well of. Negative feedback calls all of that into question. Most people question themselves when receiving negative feedback, and that’s a very painful process. What do to: Give very small amounts of feedback at a time. Share one or two things the person can work on. More negative information sends our brains to a dark place, where we feel we can’t be successful, and performance actually drops. Provide feedback on the positive changes or lack thereof, that you see. Don’t let people work in a vacuum. After you’ve seen some improvement, give one or two additional pieces of feedback. Most of us get almost no feedback at work – positive or negative. “Good job” doesn’t qualify as feedback. But that’s almost all the ‘feedback’ most people get. Even if you ask for feedback, you probably won’t get much, because the other person is concerned about your potential negative reaction. Managers are afraid employees will quit if they give negative feedback or report them to HR or the Union. People really want to know how they’re doing – good and bad – even if they don’t want to hear the message. Giving negative feedback requires courage and a trusting relationship, in which the feedback recipient trusts that the person’s motives are pure. So what to do with all of this information? Be courageous and clear. Remember that the purpose of feedback is to be helpful. Care enough to be uncomfortable. Specific is helpful. Giving feedback will always be challenging. If you want to give less feedback, get better at making specific requests. You get what you ask for. Shari Harley is the founder and President of Candid Culture, a Denver-based training firm that is bringing candor back to the workplace, making it easier to give feedback at work. Shari is the author of the business communication book How to Say Anything to Anyone: A Guide to Building Business Relationships that Really Work. She is a keynote speaker at conferences and does training throughout the U.S. Learn more about Shari Harley and Candid Culture’s training programs at www.candidculture.com. Shari, I met you shortly after you started Candid Culture at a CSAE meeting in Loveland, CO. You were a featured speaker. I thought you were fantastic and have been following you ever since. You have been a voice of reason and “online” mentor to me. Thank you for all you do! Congratulations and keep up the good work! Congratulations Shari, and all best wishes for continued success! I attended one of your training programmes about 4 years ago in Franklin Tennessee. It was so refreshing to see that you created a programme which demonstrated a deeper knowledge and understanding of the way people should be engaged and managed. Unorthodox for some people I am sure, but I knew you would continue to be successful. The people and organisations which have the courage to apply your material will also continue to be successful. I was struggling as Manager of a small team and were looking for ways to improve the situation when I found one of your video tape “3 Funny Examples of Giving Employee Feedback”. I’ve since followed you and learning every week from your weekly tips. And I am very grateful for all that I’ve learned ever since. My Best Wishes for another 10 successful year success. You are still one of my favorite presenters on authentic leadership and your examples consistently realistic and strike actionable ideas for me. You are my favorite go-to resource when I feel stuck and I often loan out copies of my book to others and point them to your blog. I get a lot of Thank You’s. Keep up the great work and presence. Another book in your future?